The muskox, known as the Oomingmak to the Alaskan natives, are huge arctic bovine mamals, weighing as much as 400 kilograms, with a thick fur coat that covers their whole body. The Muskox is closely related to the Takin, found in the Himalayas, and it is classified by taxonomists with sheep and goats. It, or its ancestor, is believed to have migrated to North America between 200,000 and 90,000 years ago, and it was alive in the Pleistocene period, making it a contemporary of the Mammoth. 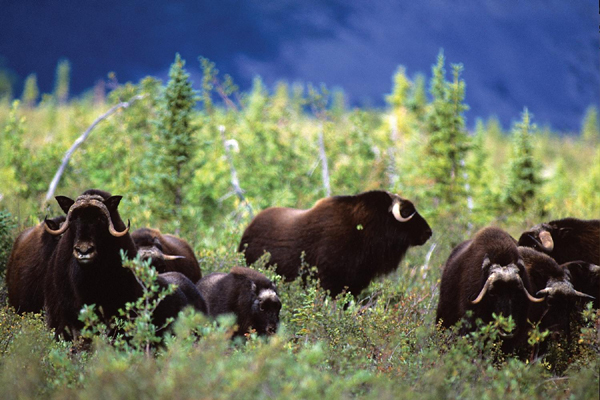 SOURCE: Terry Parker, Northwest Territories Tourism, courtesy of Canadian Tourism Commission.